I got this beautiful punch bowl and cups from my best friend; it belonged to her grandmother, and her mom was going to get rid of it because neither Lindsay nor her mom had room for it. I stopped that pretty quickly, "don't give it away; give it to me!!!" I love punch and punch bowls and have not inherited one; the other punch bowl I have used my mom bought at Goodwill because I was so sad that I didn't have one for our first annual cookie exchange. I usually use slices of lighter colored fruit, like lemons and limes, and a smaller, contrasting color fruit, like cranberries. I have also used pineapple slices and cherries quite a few times. Of course, consider the colors and flavors in the punch you are making, but I don't find that the fruit I put in changes the flavor much, except if you have leftover punch and drink it the next day. These Tupperware gelatin mold containers (new and similar) are great for making ice rings because they have lids and are lightweight. Mine is a hand me down from my grandmother. Bundt pans work just as well if you have plenty of flat freezer space and are not having to carry the ice ring with you somewhere. After placing the fruit in the mold, I pour in lemonade. I filled these just enough to hold the fruit together without making the fruit float. You could also use water, which shows off the fruit better, but I wanted to use a flavor that was in my punch. I have used ice rings a couple of weeks after making them and a couple of hours after making them. Why not make it easy on yourself and have your ice rings prepped well in advance? I run hot water over the bottom of the pan to loosen the ice ring, making sure to keep a hand ready to catch it when it slides out. The ice ring is ready to be gently placed in the punch. I usually make the punch in the bowl then add in the ice ring. Although it's easy to drop it in and splash out the punch this way, it's difficult to stir up the ingredients once the ice ring is in. 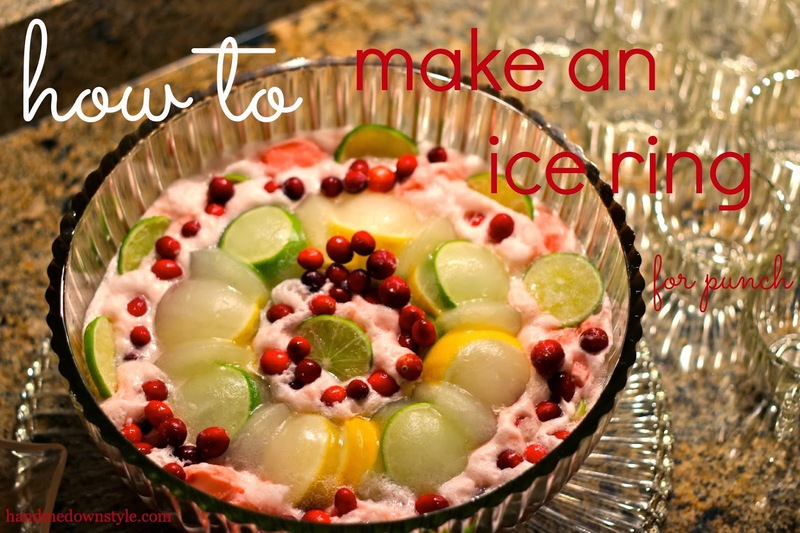 I also added frozen lime slices and cranberries to make it prettier. I will post the recipe for this punch tomorrow. 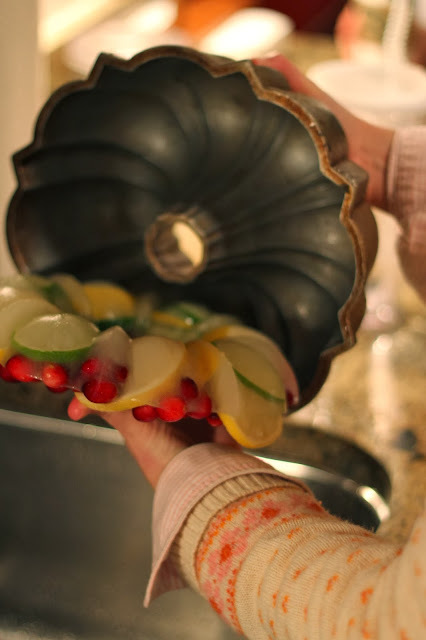 Which fruits do you think are the prettiest for decorating punch? You're such a great hostess! Definitely a touch of old-school charm and flair not often found in young ladies these days! Thank you! I try to learn from those around me with great hosting skills! This was just what I was looking for! My Bundy pan doesn't fit in my freezer, so I placed a shot glass in the middle of a pyrex bowl, layered oranges, limes, and cranberries and filled with cranberry juice for my Christmas punch! Thank you so much for posting!